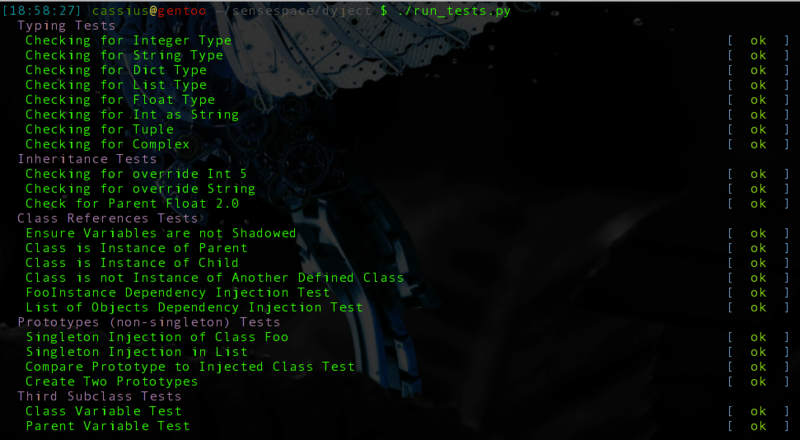 Dyject is a dependency injection module for Python. Unlike other enterprise libraries use for Inversion of Control (IoC) that have classes which look like AbstractSingletonProxyFactoryBean, dyject is simple to understand and easy to use. It supports both Python 2.7 and Python 3, has no other dependencies and uses standard configuration files to define and wire objects. The dyject module can be installed using easy_install. In the above example, each configuration section corresponds to name for identifying an instance of a class. This name is what will be used within the Python code to retrieve an object. Within each section, there must be either a class or inherit attribute (or both) defined. class must be a full path to a Python class. inherit must specify the name of another configuration section. If no class is defined, dyject will look up the class reference in inherit to determine which class to use. It will continue up the inheritence tree defined in the configuration file until a class attribute is found. All other attributes are assigned as class members. The right side of the equal sign is interpreted based on standard Python typing . Therefore, in the ConfigurationHandler example, system will be set as a string, version will be a float, supported_versions will be set as a list and so fourth. If a value starts with class-ref\, the value given must be the name of another class as defined by its section heading. Braces can be used to define lists of objects. All objects set using class-ref are singletons. Therefore, in the above example, the same ClientConfig class will be set to both the default_config property and the second element in the configs list. class/inherit = Indicates the name of the module and class to use as the instance for the given object. If no name is given, inherit must be defined and a section within the inheritence tree must define class. If both class and inherit are defined, the class within the section will be used to create the object and attributes will be assigned bottom up from the inheritence tree. Only the top class attribute will be used to define the object and other class attributes from parents will be ignored. attribute = Class properties are assigned by attribute name. The value of the attribute determines the type using standard Python duck typing. class-ref\ is used to indicate that a class references by section name in the configuration file should be set as the given property. Multiple objects can be set using braces to indicate a list of objects. Notice that the prototype argument can be set when calling get_class. By default, get_class will return a singleton object. By setting prototype to True, a new instance of the requested object is created that is not stored in dyject’s object cache. Both Source code and example for dyject can be found on Github. Unit tests can be found within the source code. Simply run the script run_tests.py and the following output should be generated. Although dyject has been tested with Python 2.7 and Python 3.2, running these tests should ensure that dyject runs sanely under older and newer version. 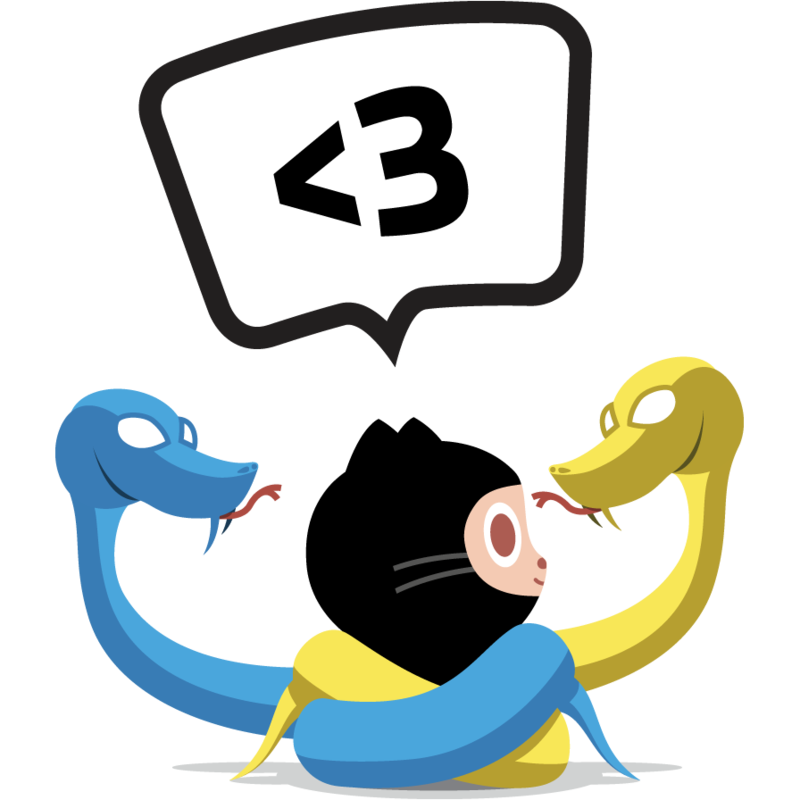 Although the name class is reserved and cannot be used as a class member name in Python, the name inherit is not. Because dyject uses this term as a keyword in is configuration, it cannot currently set a class member named inherit. Currently dyject doesn’t support constructor arguments. Classes that have constructors that take in more attributes than self without default values currently can not be handled using a dyject configuration file. Inheritance within the configuration file does not necessarily correlate to inheritence within Python. It is possible to inherit from another configuration item which has a class that is not the current’s parent. Attributes will be assigned bottom up with all class attributes being ignored except for the top one. Please submit bugs to the project’s issue tracker on Github. Dyject is licensed under the Apache 2.0 License.